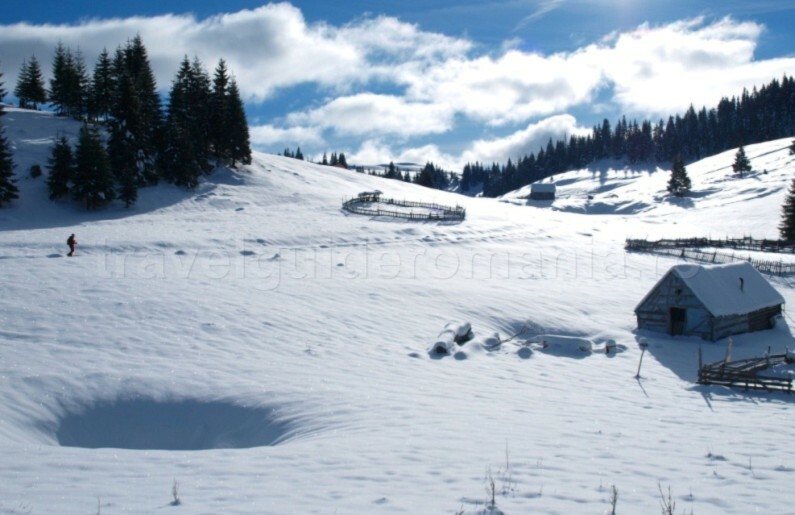 Padis is a superlative of the Apuseni Mountains. 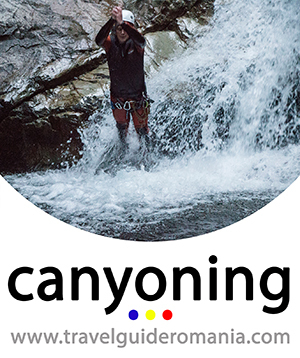 Here you can find in just one place caves, pit cave, gorges, canyons, karst towers, rock walls, sinkholes, springs. Padis is the largest karst area of the country. It is the place where every tourist can find something for his taste. Either it’s a walk in the spruce old forest and the quiet glades or a trail in a high difficulty underground. 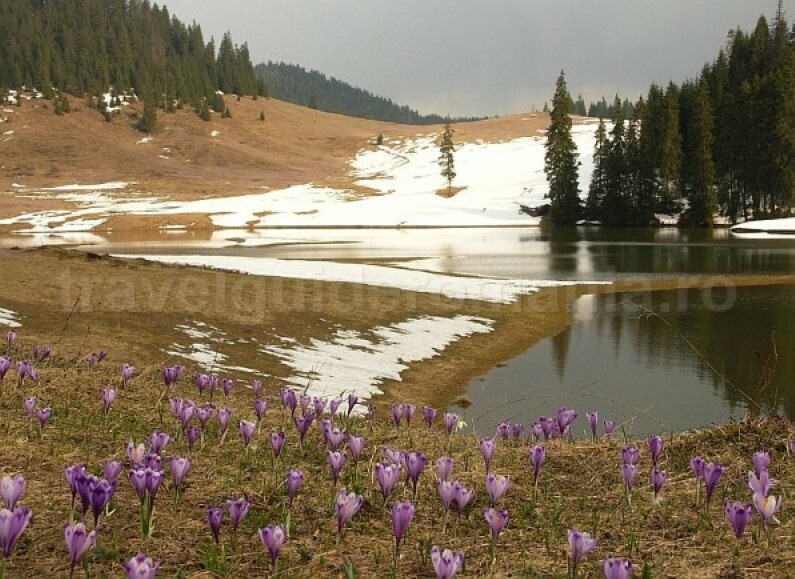 A less noticed activity by the tourist absorbed by the beauties of Padis takes place in the isolated glades of the plateau. 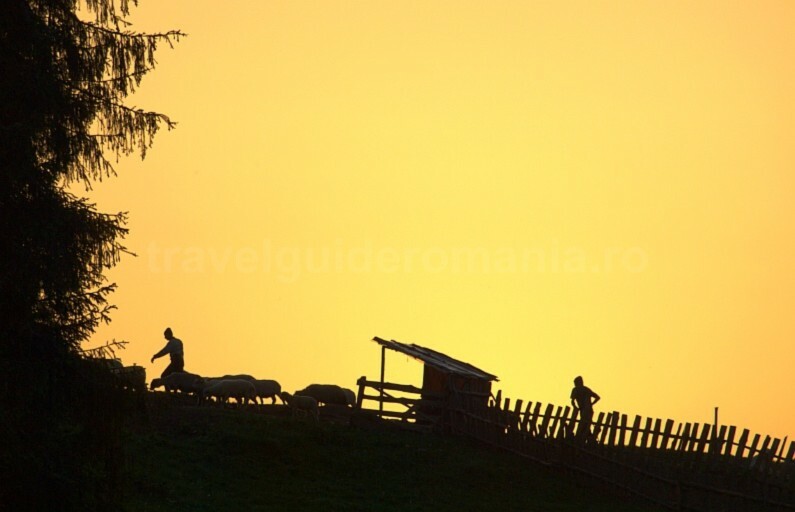 It is the herding, the locals from the Beius Basin, the Crisana people, that climb together with their animals in Padis. Padis is the place where you can find an icy cold water spring, water that a hundred meter further disappears again underground. It is the place where one can find sinkholes that swallow the water and then unknowingly it surfaces in another spring. And the game is endless. Many calcareous arches and dark precipices where the water disappears can arouse your curiosity and imagination. A secret world, hidden to the eye, waits for you to discover it. If the surface seems quiet, the underground is a chaos: huge halls, huge rocks ready to fall in abyss, huge logs stuck between rocks that block underground trails. You are here in an endless adventure. The humid tall walls attract you, the rumbling water that runs over the huge rocks scare you. You feel as an ant in the giants’ world. In Padis there is a continuous battle between water and limestone. The closed basin Padis – Cetatile Ponorului extends on 36 km2. It is delimited by the forested peaks that separate it from the basins of Black River, Aries River and Somesul Cald River. Some of the peaks that delimit the basin are lookout points over the plateau and the surrounding area: Măgura Vânată peak (1641m), Biserica Moţului (1458m), Vărăşoaia peak (1441m), Galbenei rock peak (1234m), Glăvoiu peak (1426m). Padis is a closed basin, as no valley on the surface crosses it. 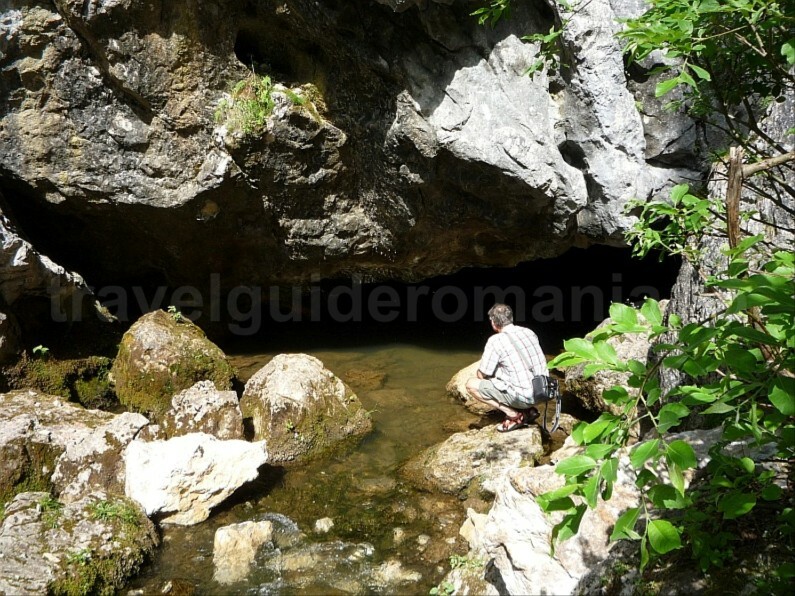 All waters go underground and arrive at the surface in the wild valleys and gorges around the plateau: Galbena, Somesul Cald, Boga or Valea Rea, Oselu, Bulbuci. 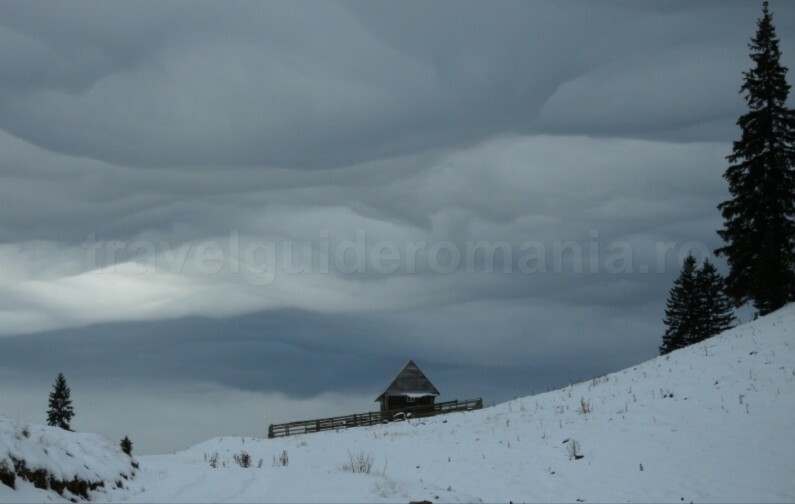 firstly you can continue on the road that turns right, on a forest road up to the Glavoi Glade and Cetatile Ponorului Chalet. 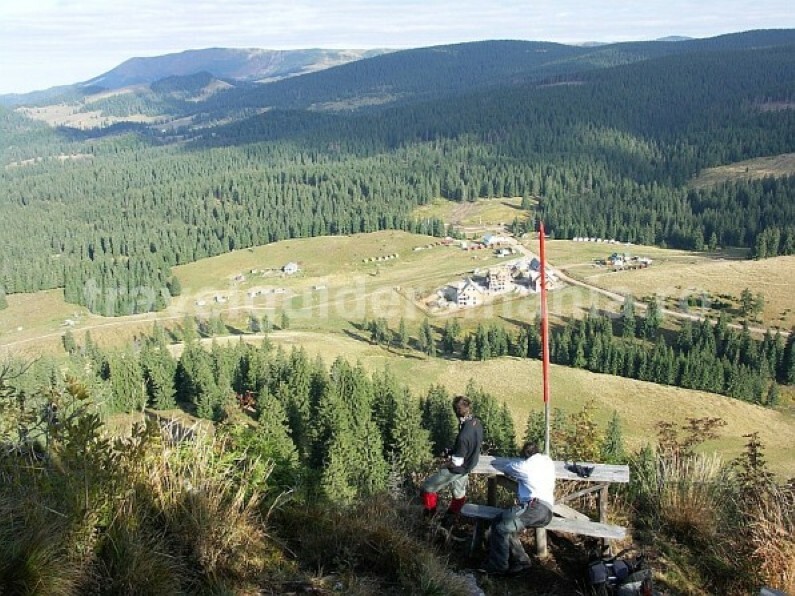 – One is going to Padis Forester’s Hut, Touristic Information and Visiting Center of the Apuseni Natural Park Administration. – The other one goes to the Varasoaia Chalet until the entrance in the Cetatile Radesei Circuit. From Cluj-Napoca the road that crosses Rachitele-Pasul Prislop is asphalted up to Ic Ponor. Until Padis there are 10 km of rocky forest road. Not recommended with small car! 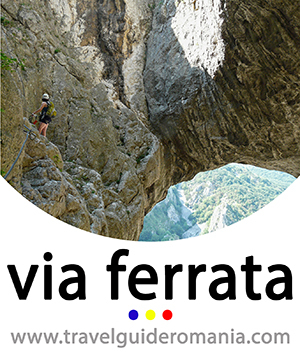 On foot, the access is made on touristic marking from Vartop, Casa de Piatra, Garda or Stana de Vale. 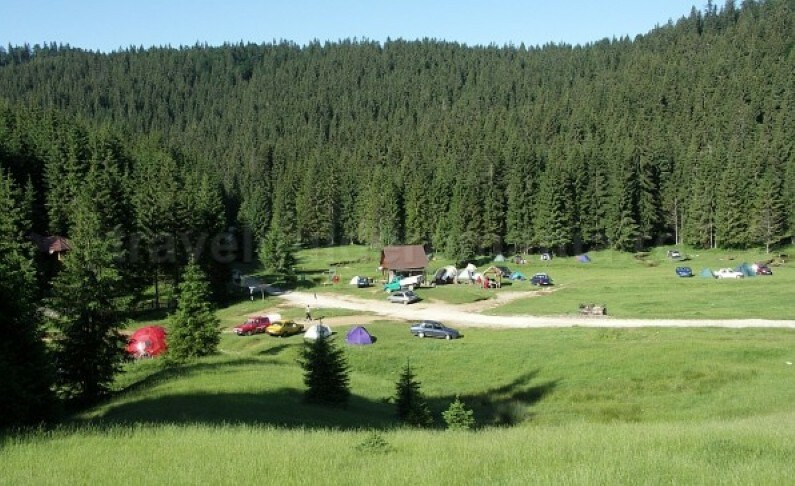 camping without facilities in Poiana Glavoi or Sesul Padis. General data on the Padis Plateau. Wherever we come from in Padis, we can see the waves of the plateau, due to the many sinkholes of different dimensions. The fact that some of these sinkholes nestle lakes and that there is no breeze because of the closed basin favor the formation of a special climatic phenomenon – the Padis fog. In the evening, when the air gets colder, the warm air accumulated over daytime lifts it get’s upper, being lighter. When meeting the cold air there is a condensation that will produce a thick fog. Having no place to fade away, the fog will crawl along over the earth giving the landscape a fantastic aspect. At the same time, the lack of scattering of the cold air in the valleys determines a thermal stratification. The temperature rises along with the height, a phenomenon observed by vegetation inversion: first the coniferous forests and then the deciduous forest. 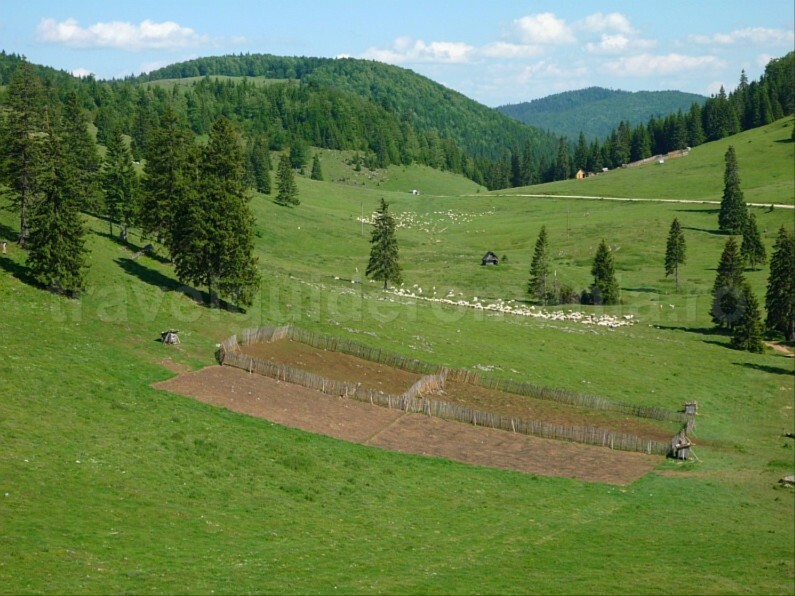 The Padis Plateau is like a plain, Padis Plain, between 1250-1280m, with scattered sinkholes. 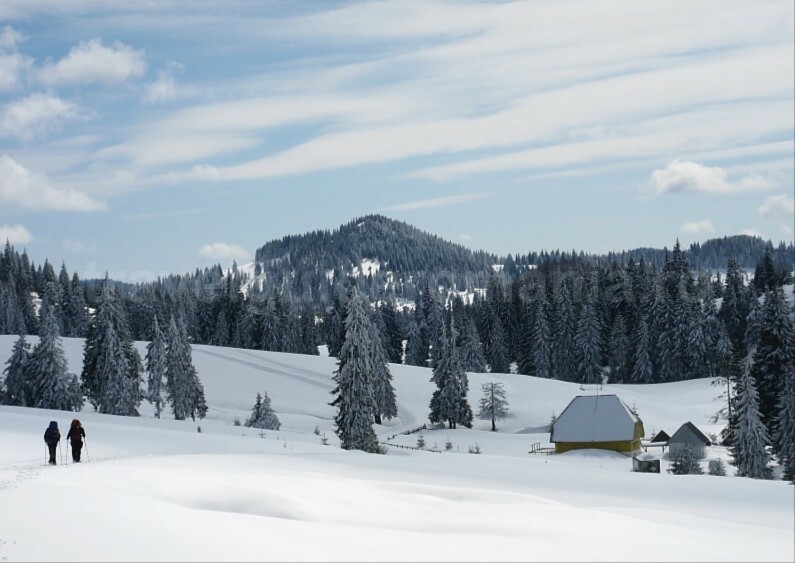 It is surrounded by peaks that rise 400 m higher (the Magura Vanata Peak). 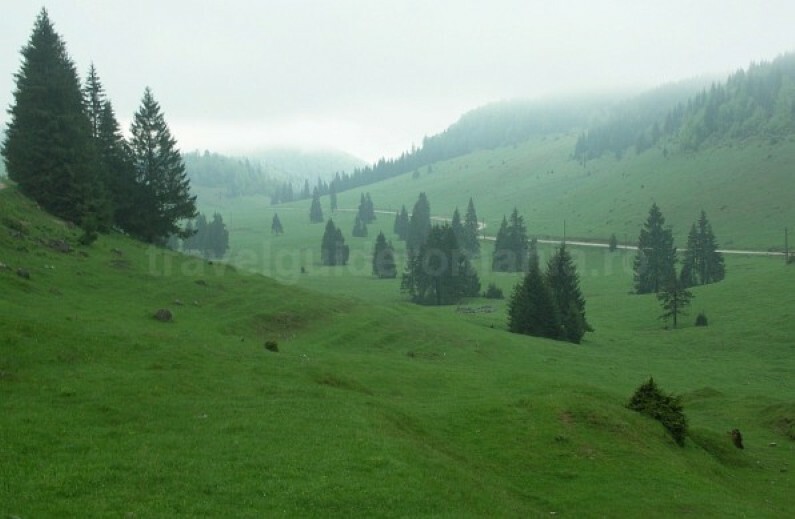 The Padis Plateau, divided by clusters of spruces, goes up to the Carligate Top – The Braiesei Edge. 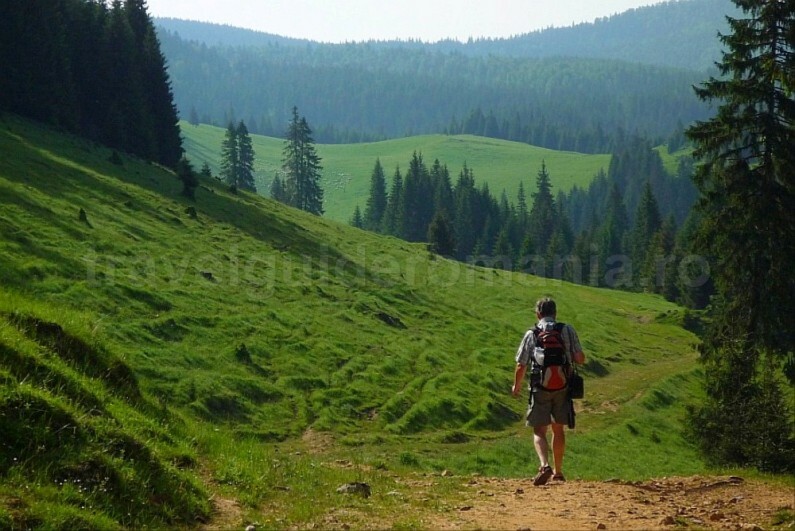 The touristic trails and main interest points in Padis Area. The marked trails start from the former Padis Log Cabin. It burnt up in 2017. There are also some guest houses and small houses in the area. 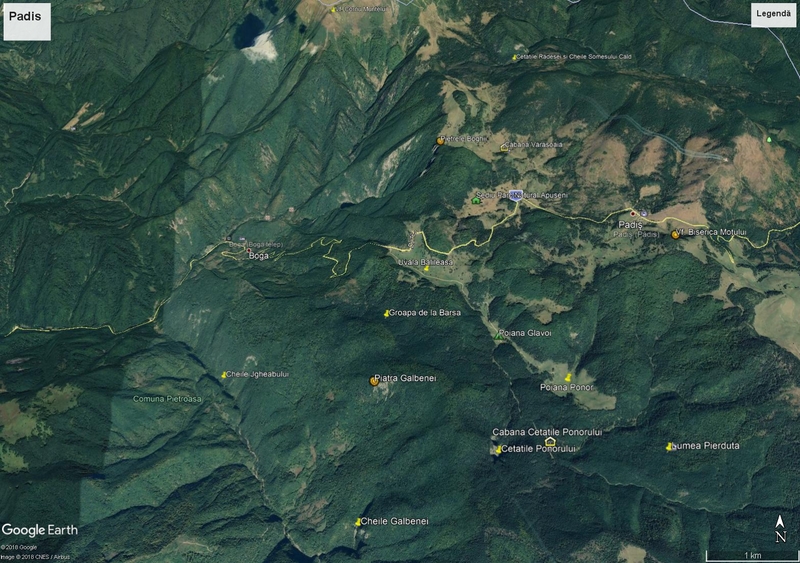 >From Padis Chalet to south-east the marked trails are: the yellow dot (the Galbenei Circuit), blue dot (the Cetatile Ponorului Circuit), red triangle (towards the Caput Cave) and yellow cross (towards the Lumea Pierduta-Lost World). > Biserica Motului Peak (1458m). Climbing here you will see more clearly the whole area. There is a lookout point. The access to the peak platform is made from the Padis Chalet. >The Lookout Point from the Magura Vanata Peak. You can reach it by following the yellow triangle, in a 4h circuit. 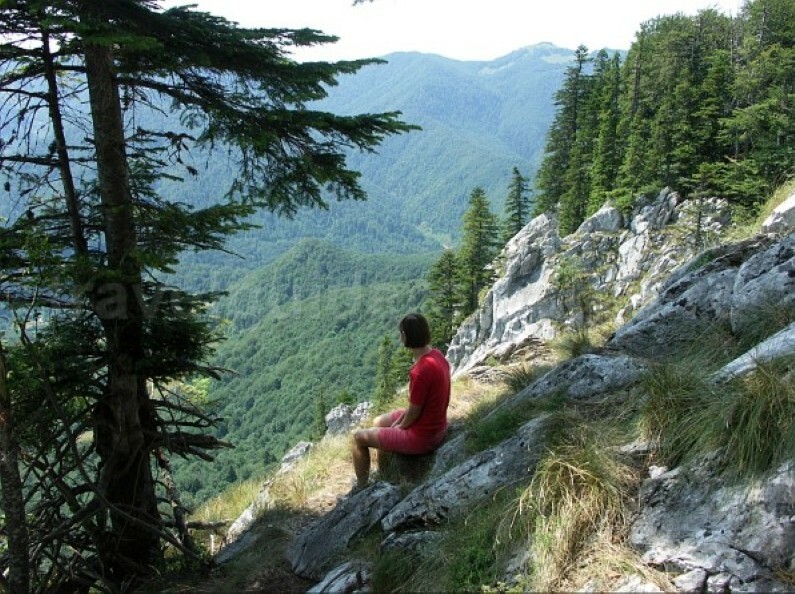 > From the Padis Forester’s Hut you can follow the red dot trail towards the Piatra Boghii Lookout Point. 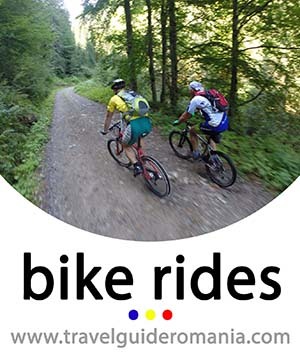 This trail is a thematic one, as you can find along it panels that invite you to discover some of the characteristics of the Padis Area. 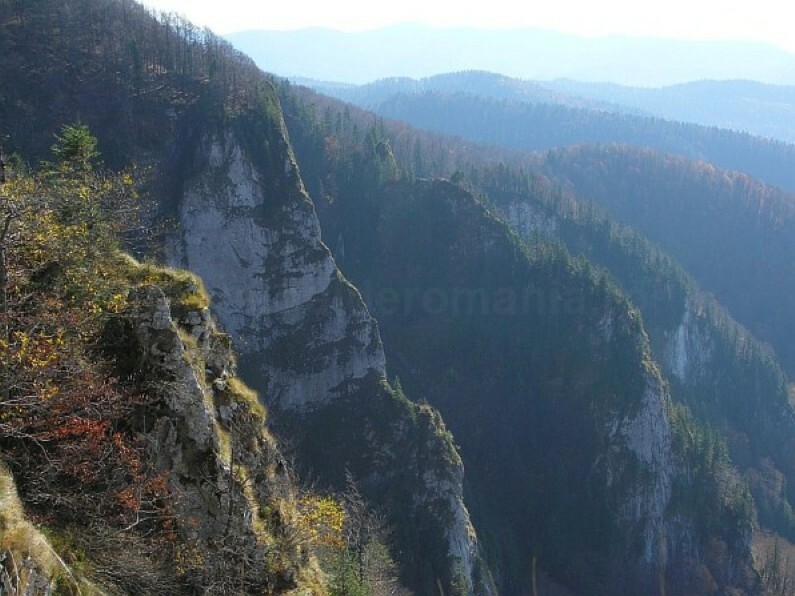 > Pietrele Boghii (Lookout Point from Boghii rocks). You can reach here from Varasoaia Glade following the red dot in red circle. The trail stands above impressive precipices – The Boghii Amphitheatre – that guard the Boga Valley. This lookout point offers a wide panorama of the Boga Valley, of the holiday village Boga and the Rea Valley guarded by the Cornu Muntilor Peak. From here the marking continues down ways on a steep path up to the Sura Boghii Cave. 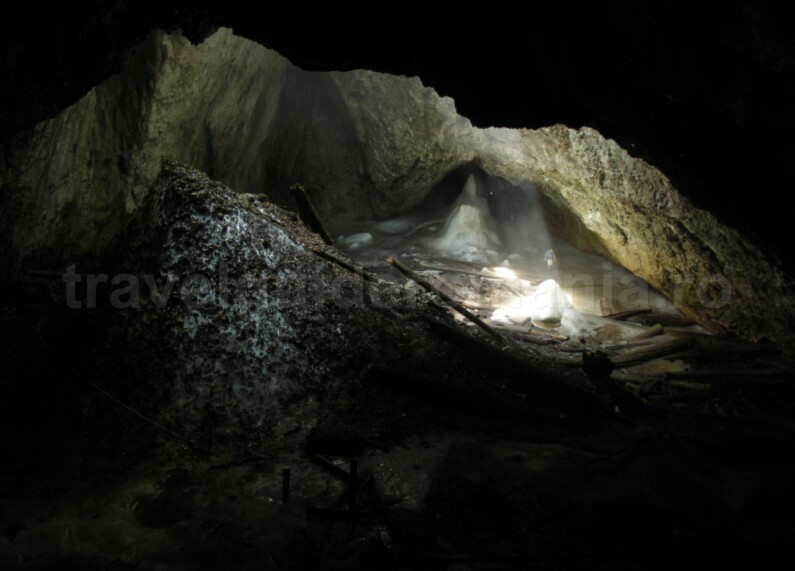 The cave has an entrance of 2,5m height and 8m width, a 200m length, but it is poor in concretions. > Varasoaia Glade shelters a small permanent sink lake. From the Varasoaia Lake, the forest road crosses a small saddle, where you can see some sheep folds and continues until the end of the glade. 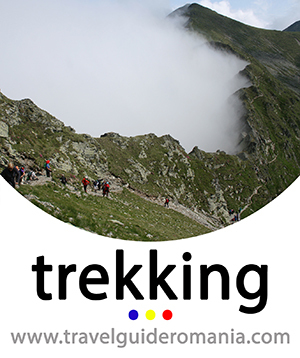 It is here that the trail towards the Cetatile Radesei and the Somesul Cald Gorges starts. 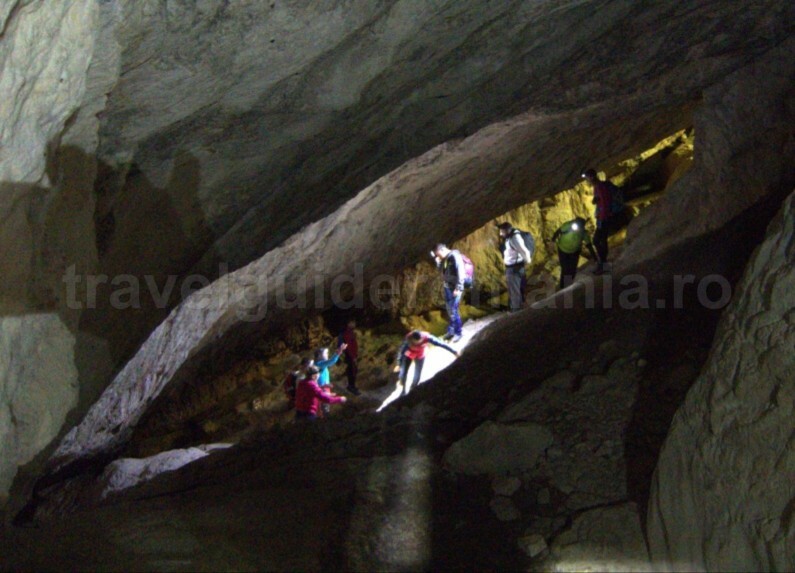 The Varasoaia Glade shelters the deepest cave in Romania, Avenul V5. 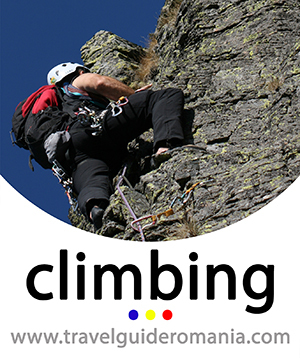 For a complete tour of the area we recommend you a climbing up to the Varasoaia Peak (1441m). 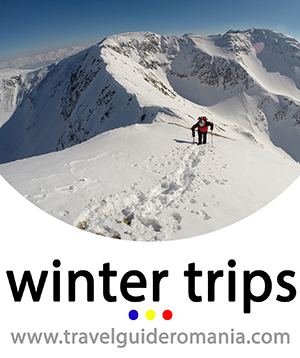 There are panoramic views towards the Beius Basin, Vladeasa Peak, Carligate Peak and the Cumpanatelu Saddle. 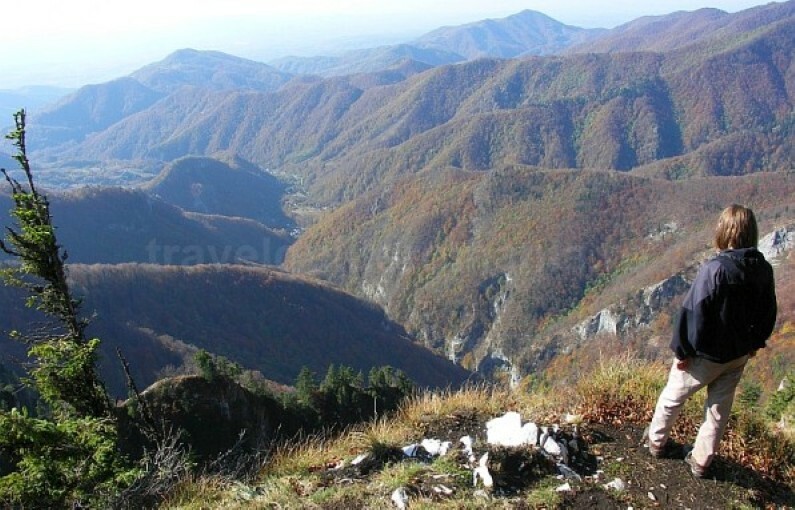 You can see up to the Piatra Talharului, towards the Padis plateau and the Biserica Motului Peak and further on to the Cucurbata Mare Peak and the spring area of the Somesul Cald River. Varasoaia Glade is run by red stripe, blue stripe and yellow stripe markings. > Lumea Pierduta (The Lost World) is a forested karst basin. 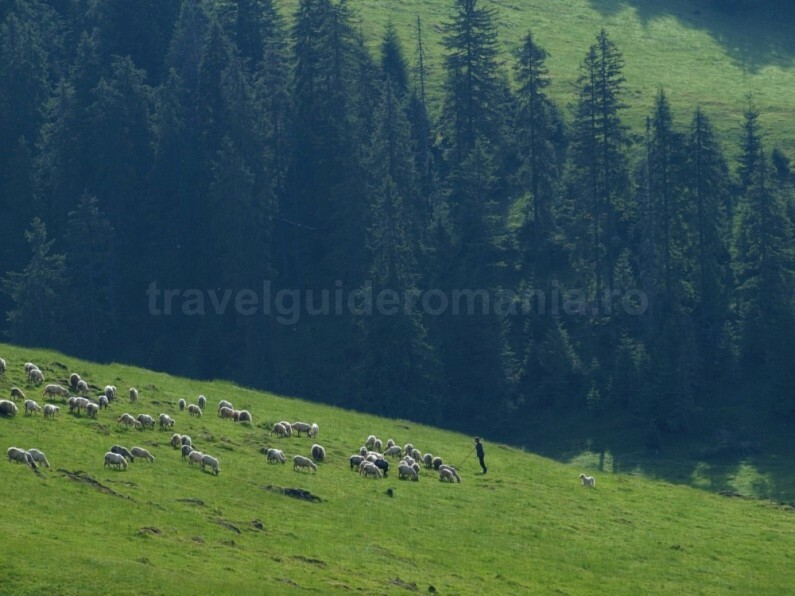 It is guarded by the Bear’s Valley and the Dry Valley (where you can find the Cetatile Ponorului Chalet) both joined by forest roads. 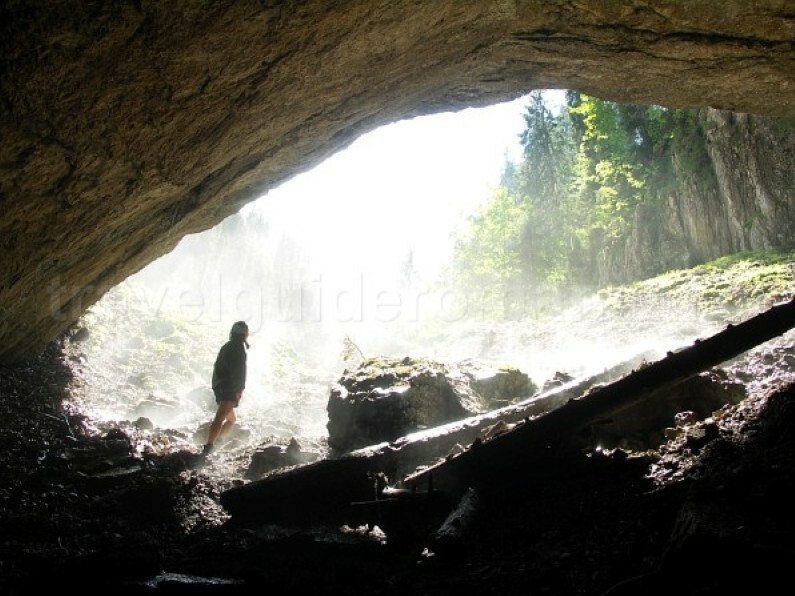 It is the cavers’ world as the Lost World hides a rich network of active galleries. 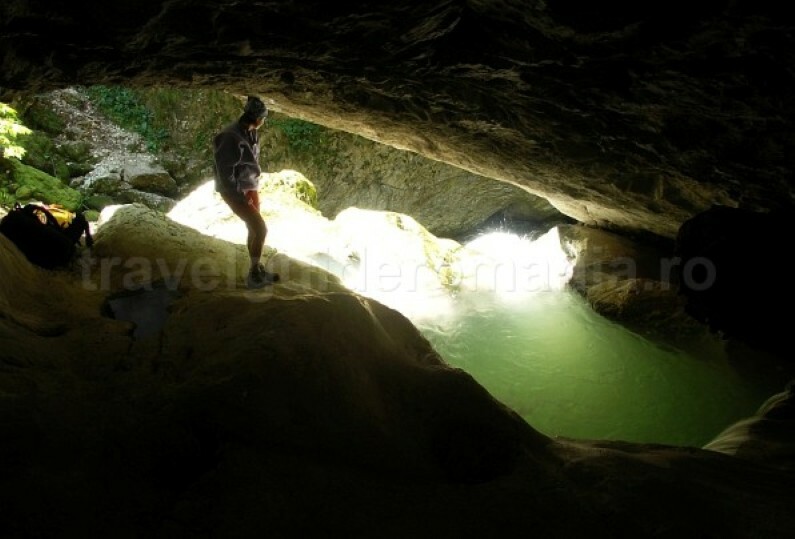 Gemanata Pit Cave (92m) has two entrances due to the natural bridge that divides its mouth. Acoperit Pit Cave (35m) etc. Caput Cave is the one that collects the waters in this hydro-graphical basin. 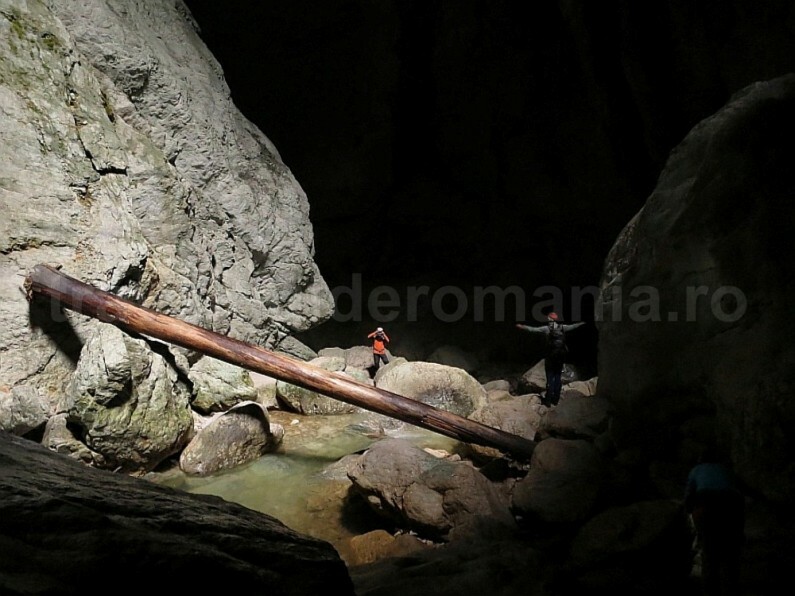 This 1800 m cave is accessible only with caving equipment. You can visit it at the entrance, the place where water falls down in a 10 m shaft. There’s another spectacular lookout if you climb a bit on the right of the entrance, up to a platform above some deep shafts. 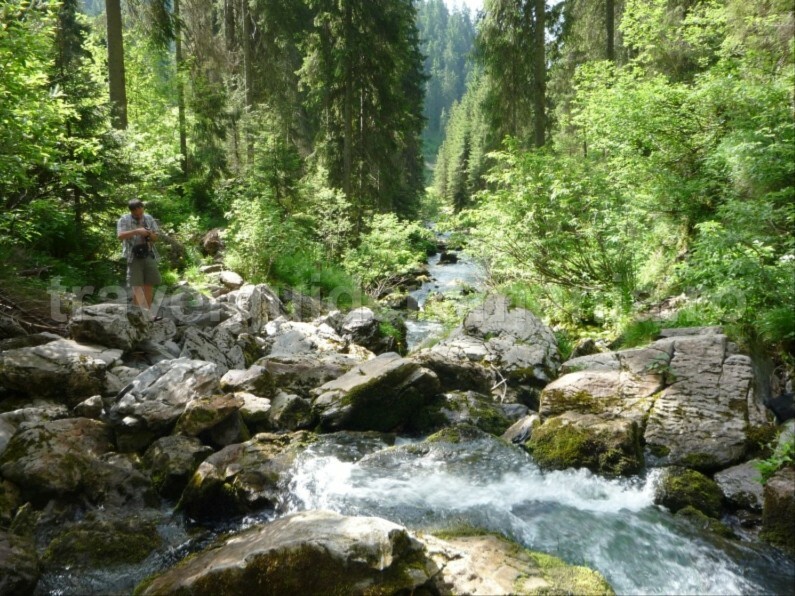 Two springs, the Bear’s spring and the Cold spring form the Bear’s Valley that will soon lose in the river bed. 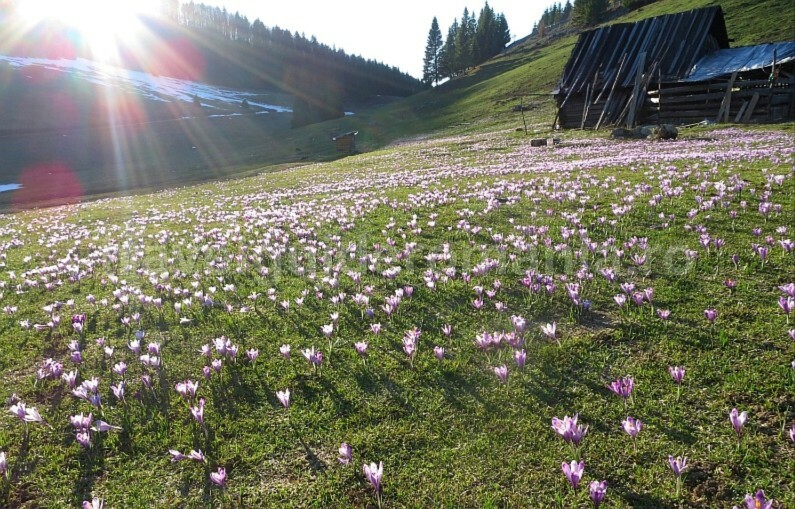 >The Ponor Glade is known as one of the few karst fields in the country. A river of about 300m in length springs and disappears here. 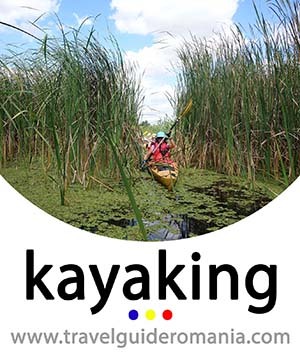 It is the shortest watercourse in the country. The water springs from a cave at the base of a rock wall. Finally it disappears in the river bed, through some hollows, at the other end of the Ponor Glade. 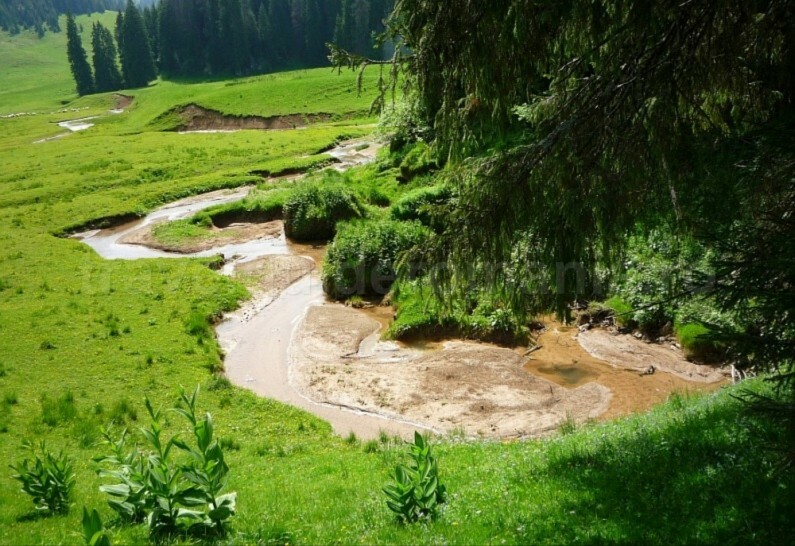 The strong spring drains all the waters under the Padis Plateau. After abundant rains or snow melting, the hollows do not succeed in draining all the water. Then, a temporary lake is formed. 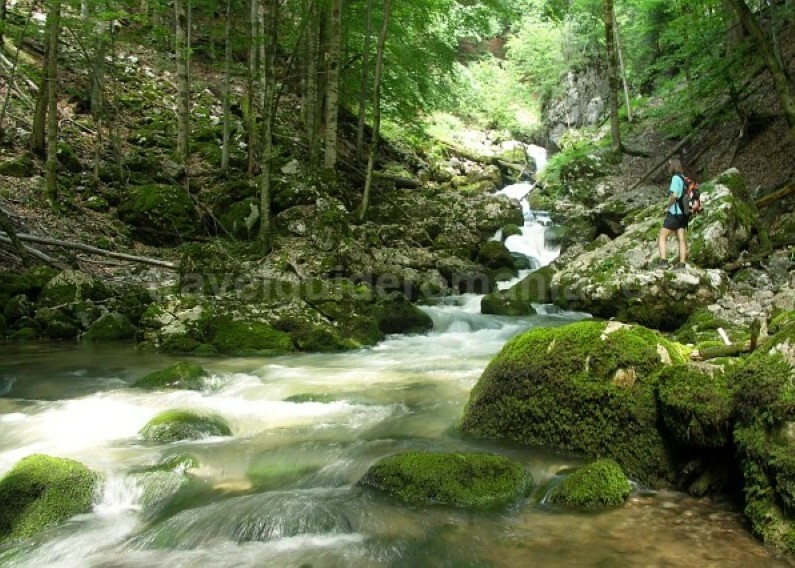 The waters that disappear in the Ponor Glade will surface in the Cetatile Ponorului. The glade is declared a conservation area of biological diversity. Camping is forbidden in this glade. 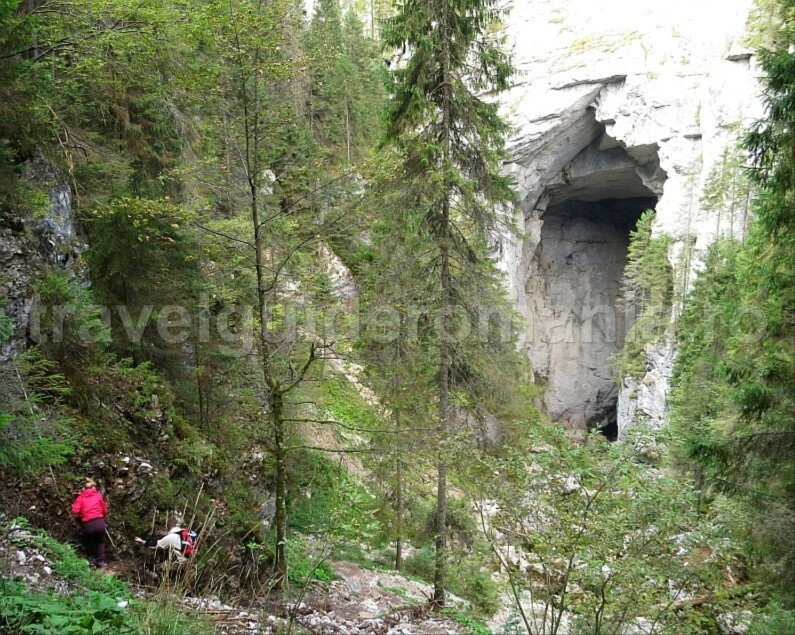 The easiest access in Ponor glade is from the Glavoi Glade, on a large, unmarked path. The road detaches from the Glavoi Forester’s Hut (about 15 minutes). Ponor Glade has yellow dot, blue dot and red triangle markings. 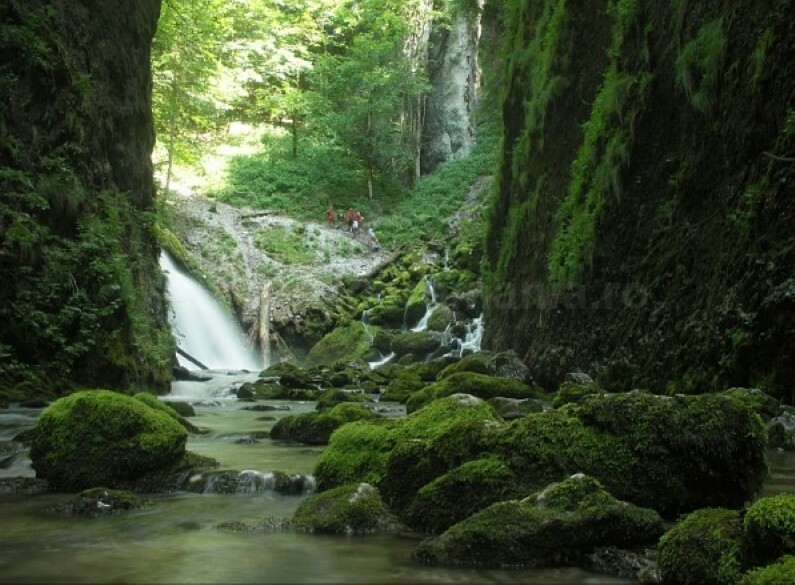 In order to reach the spring from the center of the Ponor Glade you follow the trail marked with double blue point (10 minutes). 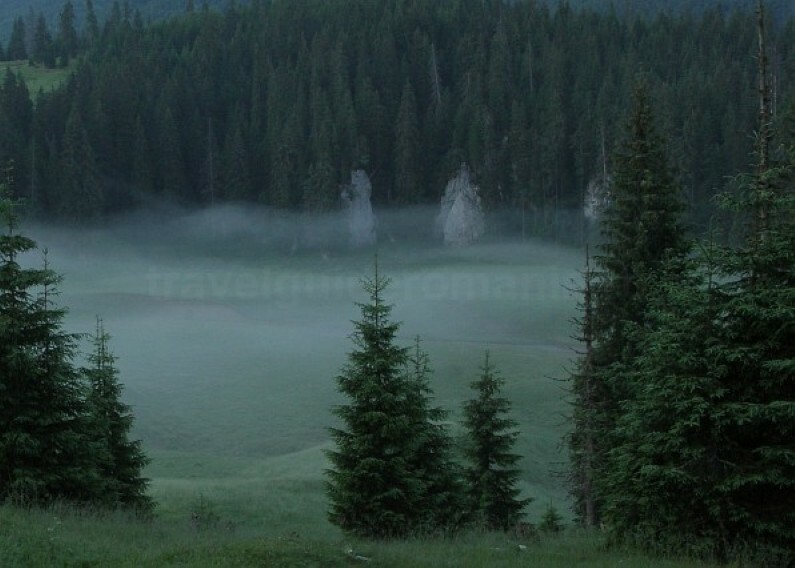 >Glavoi Glade is the main camping place of those that come to Padis. 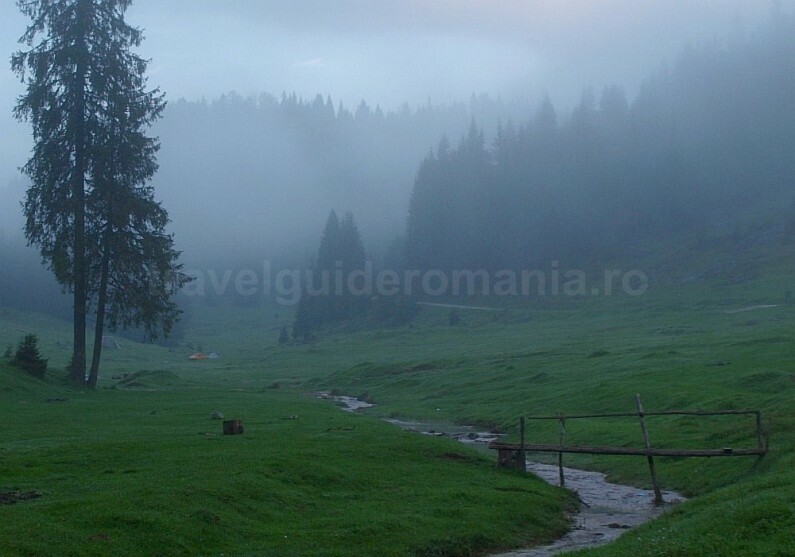 Cetatii Valley crosses the glade and after the, it disappears in the Cetatile Ponorului Cave. 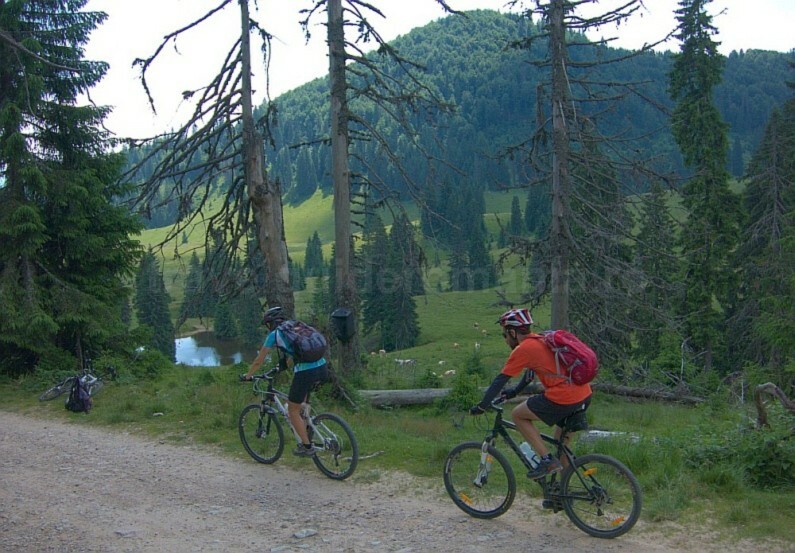 Almost all touristic trail pass by Glăvoi. You can find drinking water at the spring near the Mountain Rescue Refuge. The food can be bought at the few stands opened during summertime. In summertime there is a Mountain Rescue Refuge, open all time. 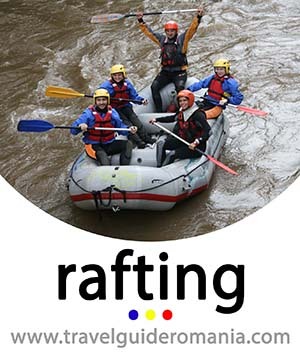 Unfortunately there aren’t touristic facilities nor established regulations for camping. 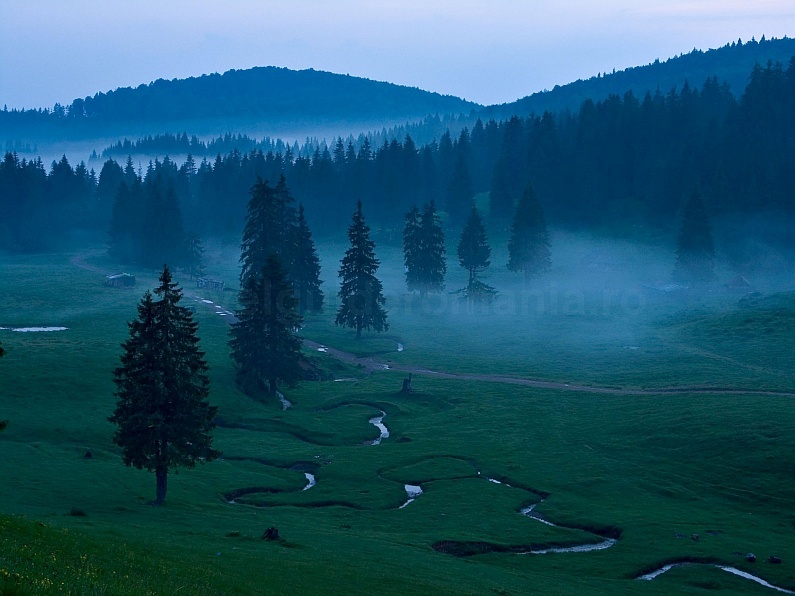 You can reach the Glavoi Glade on the road Boga – Padis. 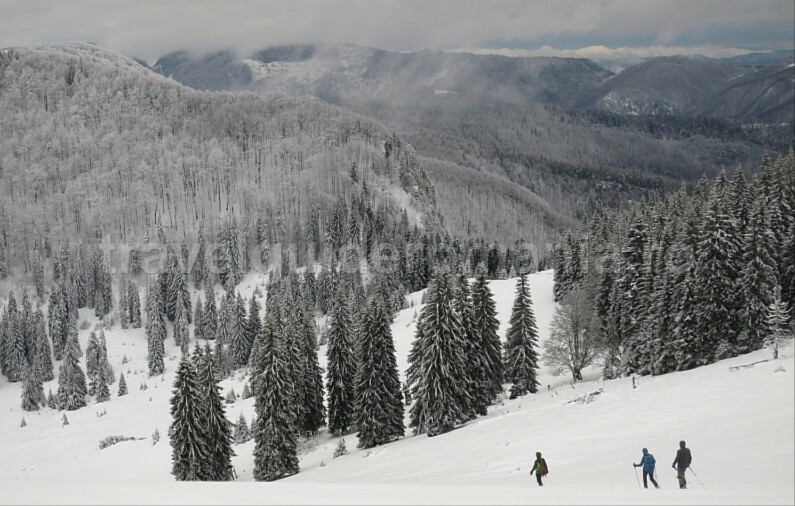 From Scarita Saddle there is a forest road that crosses the south of the Balileasa area and then the Glavoi Glade up to the Cetatile Ponorului Chalet. 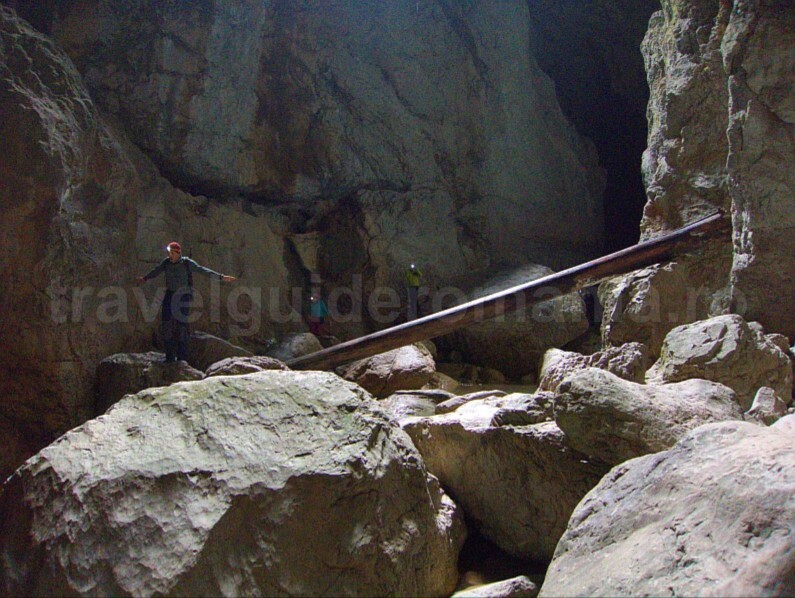 >The Cetatile Ponorului Cave is the most impressive karst formation in the Apuseni Mountains. 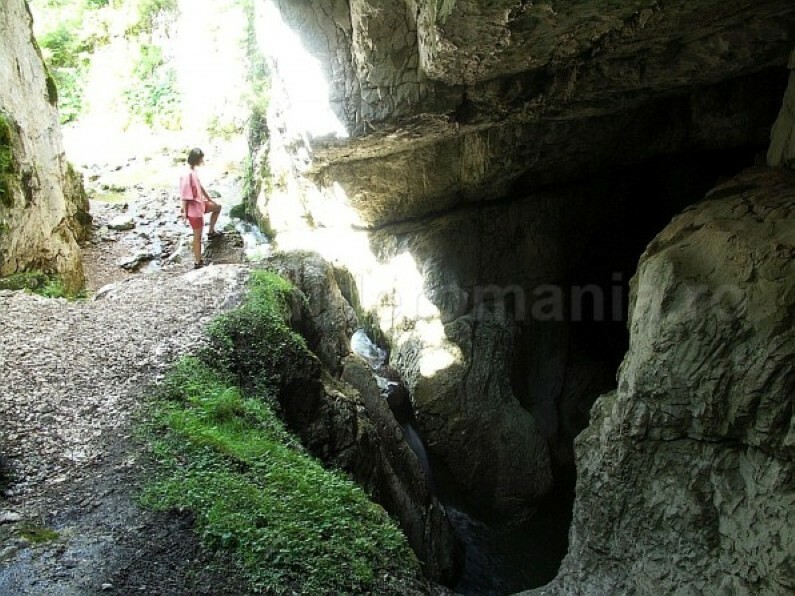 > Balileasa Uvala is a terrain with many sinkholes surrounded by forested tops. 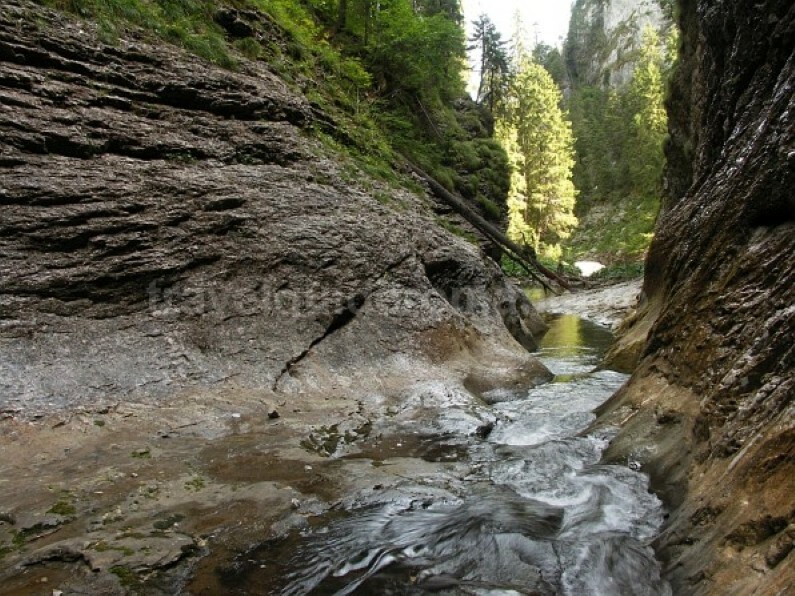 On the dividing top between the Balileasa Basin – Cetatile Ponorului and the hydro-graphical basin of the Galbena River, there are touristic attractions worth visiting: Barsa cave, Zăpodie cave, Black cave, the Underground Glacier from Bortig and the Focul Viu Glacier (Living fire glacier). 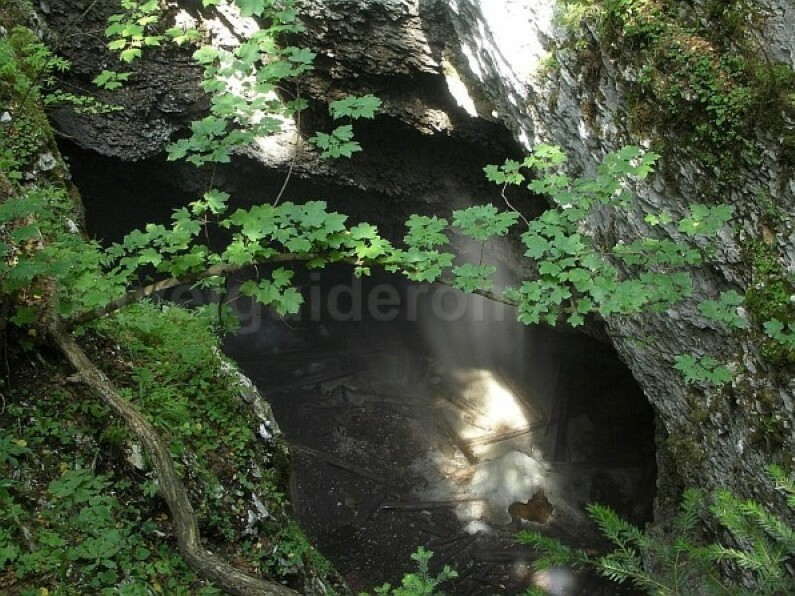 >The Bortig Pit Cave that shelters the Bortig Underground Glacier is impresses with its dimensions. It is 55 m deep and 35m in diameter. 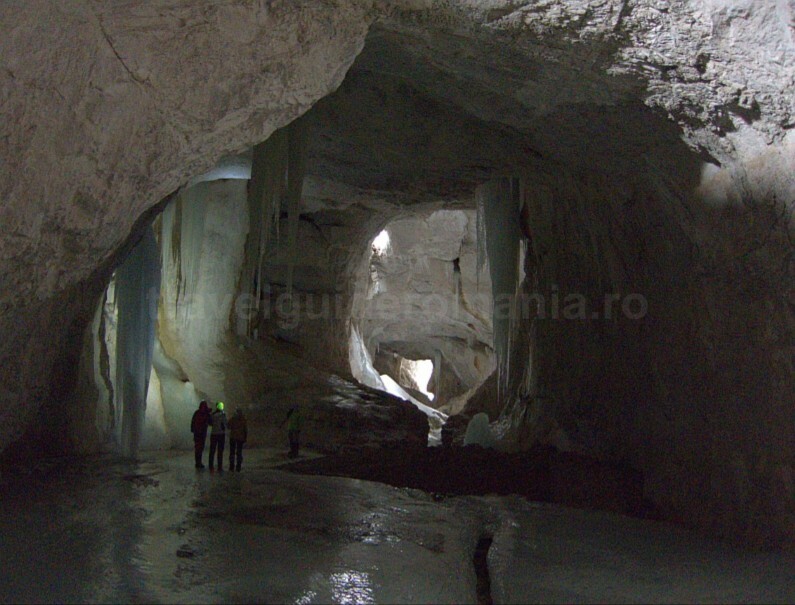 It is the second underground glacier as dimensions in Romania after the Scarisoara Glacier. 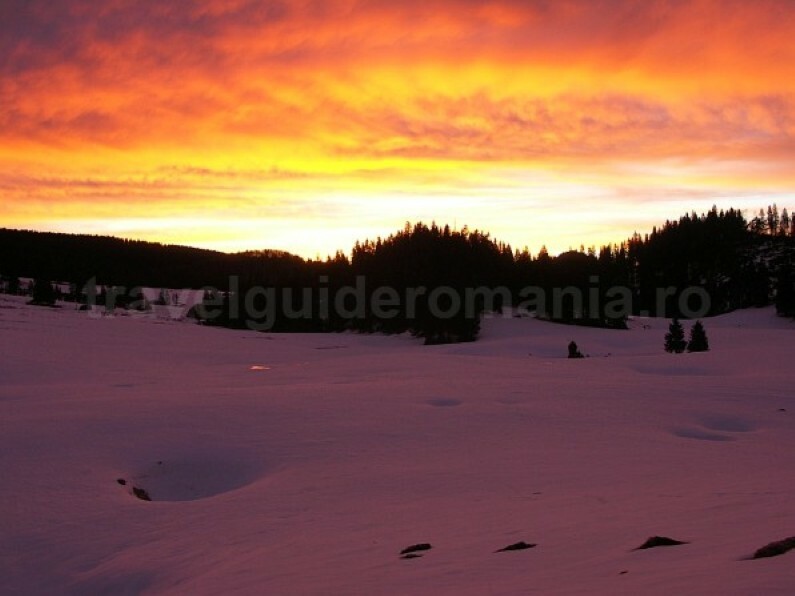 >The Focul Viu Glacier (The Flaring Fire) is the third underground glacier in size in the Apuseni Natural Park and in the country. 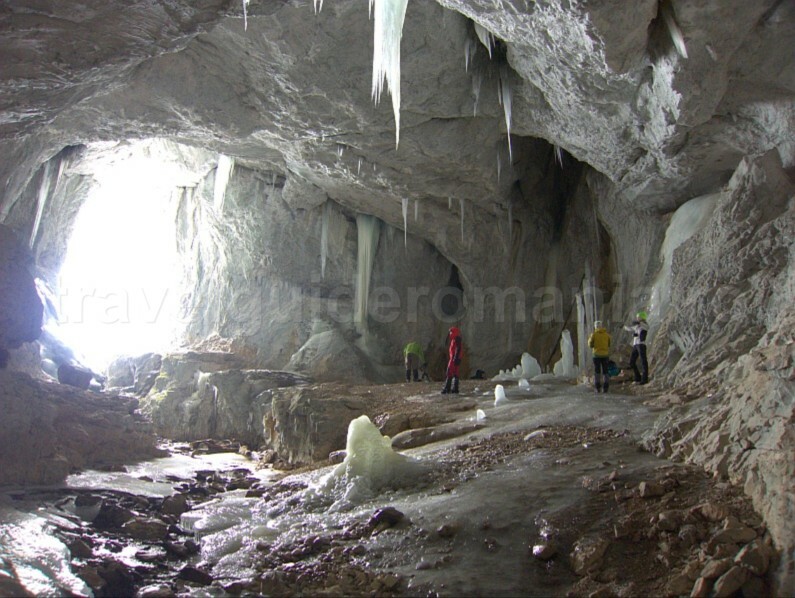 At the mouth cave there is a wooden balcony where you can admire the ice formations. Spring is the most recommended season to visit the glacier. And the best time is around midday. It is then that the sun gets through the hole in the ceiling and lights the ice, hence its name. 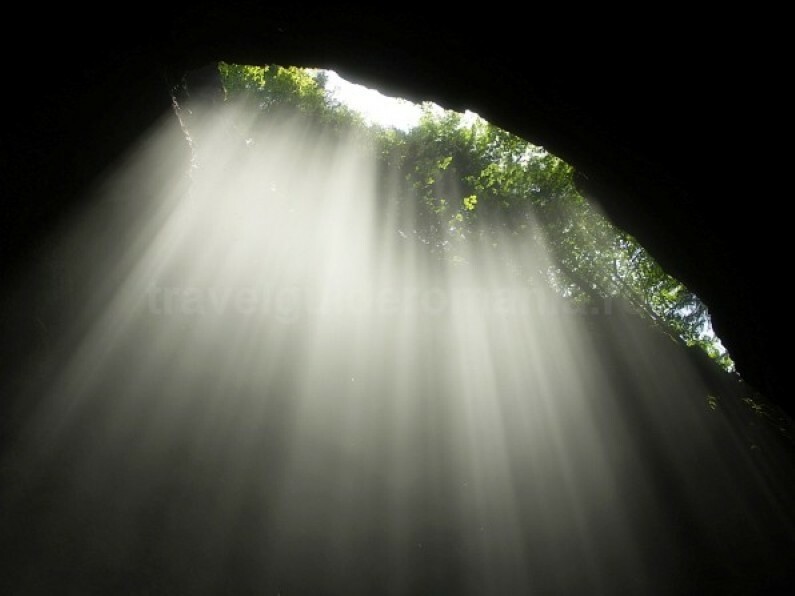 If you climb on the left of the cave entrance you reach the hole in the ceiling in a few minutes. Here you have a different angle over the glacier. This hole favor the accumulation of cold air in the cave. 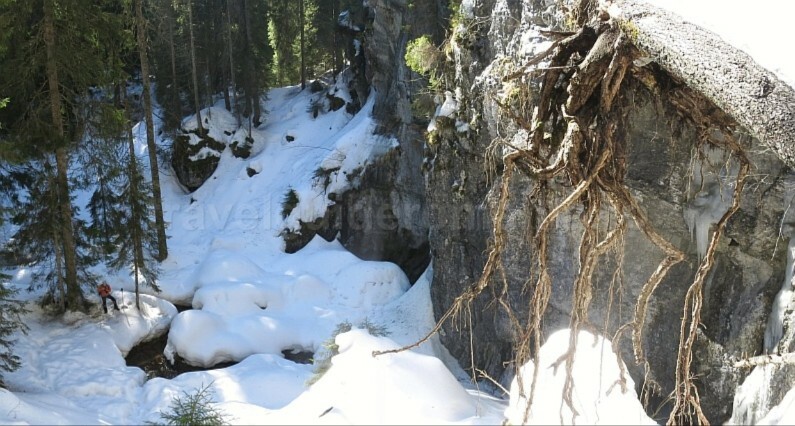 Ice and snow covers the cave floor and in the middle of the main hall there is a heap of rotten wood covered also by ice and snow. At the end of the hall there are the ice columns that vary in size from year to year. 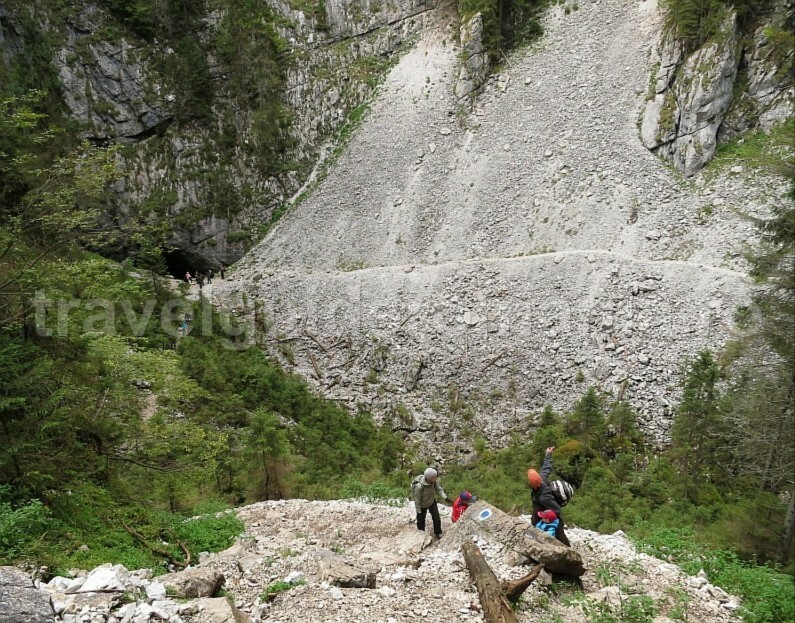 Access to the Focul Viu Glacier: on the yellow dot circuit that links Padis to Galbenei gorges. From this trail another trail parts with double yellow dot mark that takes you to the Piatra Galbenei Lookout Point. From the bifurcation the round trail takes around 1h. Galbenei rocks offers a lookout of the whole Galbenei Basin and meanwhile The Ruginoasa Pit is attracting your attention. 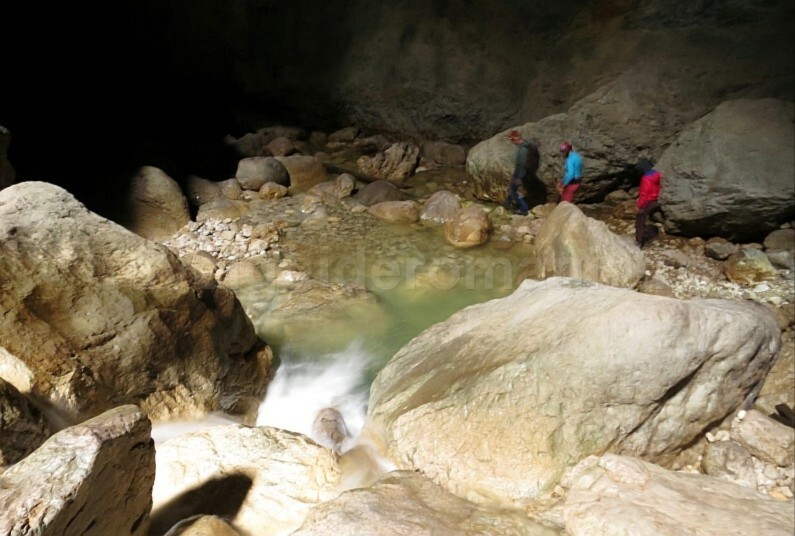 >The Pit Hole from Barsa is a forested karst plain (about 2x 1 km), very wild and full of sinkholes and caves. The marking crosses at the beginning before the Black Cave, at the base of a 6m high rock. 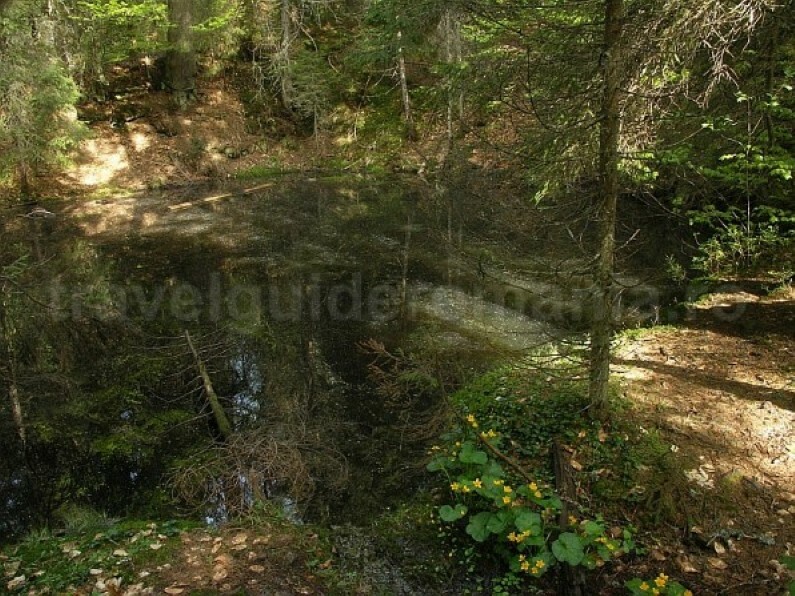 A small lake of about 14m, near the tourist trail, the Taul Negru (Black Lake), is an original appearance in the middle of the forest. It is fed by an underground spring. 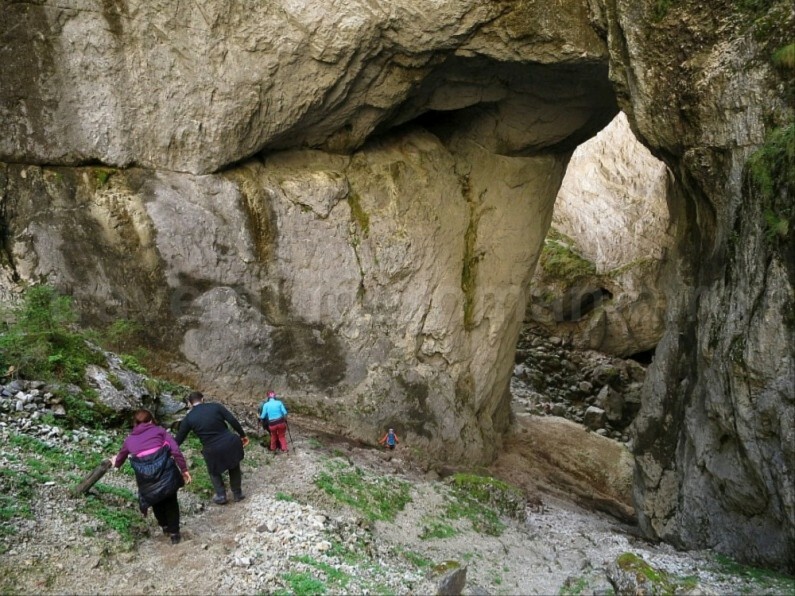 The path continues to the first entrance of the Barsa Cave. A deviation marking double yellow dot goes to the main entrance in this glacier, as well as to the Zapodie Cave, inaccessible to tourists. 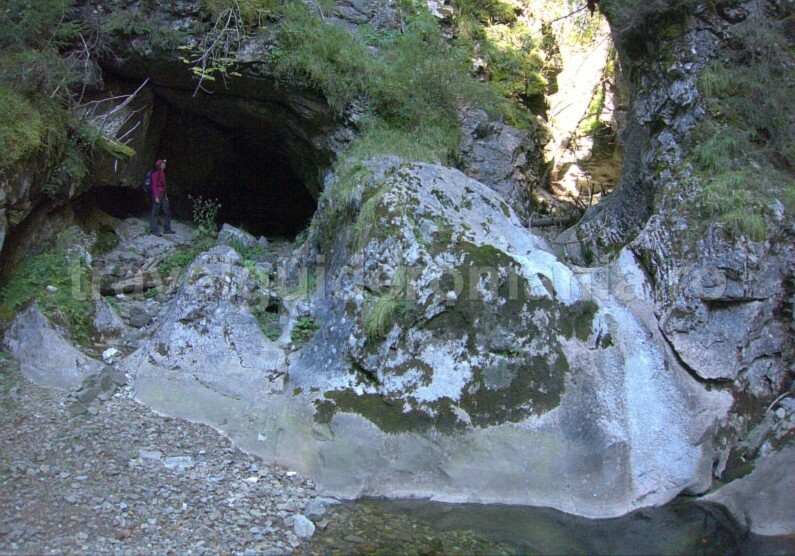 The Zapodie Cave has a large entrance, of 8m on 4m and a large underground network of over 7km of lakes and waterfalls. The final lake in this cave was crossed with an independent diver in 1974, doing the junction with the Black Cave. 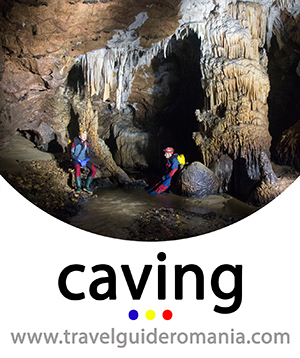 The Black Cave, Barsa Cave and as well as the Zapodie Cave can be visited only with a caving equipment, by obtaining the specific notices of the Romanian legislation. From Barsa Cave the yellow trail marking continues up to the Balileasa Basin and then to the forest road that goes to the Glavoi Glade. access and camping in Padis is free of charge. all tourist must take away their waste, out of the park. if you have questions regarding the trails, do not hesitate to ask the mountain rescuers that are present during summertime in the Glavoi Glade.